Siegfried Müller was born on 13 March 1924 at Wilkau. He began his flying training with the Luftwaffe in 1941 with Luftkreigsschule 1 at Dresden before progressing through the Jagfliegerschule Zerbst and completing his training with Ergänzungs-Jagdgruppe Süd. Müller initially served with II./JG 51 based in southern France. In 1943, he participated in the air battles over Salerno and Monte Cassino where he claimed his first victories. 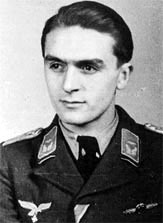 In March 1944, Müller volunteered for service with Sturmstaffel 1 under the leadship of Hans-Günther von Kornatzki. He flew his first mission with the unit on 24 March. On 8 April, he shot down a USAAF B-24 four-engine bomber, but he had to make an emergency landing at Salzwedel when his Fw 190 A-7 “White 7” was damaged in the combat. On 13 April, after claiming a USAAF B-17 four-engine bomber Herausschuss, his Fw 190 A-8 “White 8” was damaged by return fire from the bombers and Müller had to make another emergency landing, this time at Wertheim. On 29 April, he achieved another B-17 victory, but was again hit and had to make yet another emergency landing in Fw 190 A-8 “White 19” near Jerxheim. Sturmstaffel 1 was disbanded and became 11. (Sturm)/JG 3. 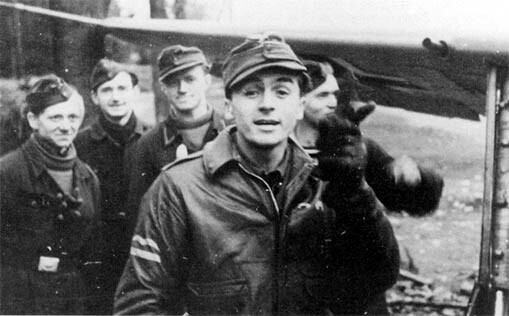 Lt. Siegfried Müller, Staffelkapitän of 13./JG 3 after combat mission on 16 March 1945. During this mission he downed Yak 3, his 17th and last victory. On 2nd November 1944, Müller downed a B-17 as his 10th victory. On 1 January 1945, he led 16./JG 3 during Operation Bodenplatte and shot down a RAF Typhoon fighter. He then flew with 13./JG 3 on the Eastern Front and gained three victories over Russian flown aircraft. In April 1945, Müller joined JG 7 flying Me 262 jet fighters, but did not add any further victories to his tally. Siegfried Müller was credited with 17 victories in 137 missions. He recorded three victories over the Eastern front. Of his 14 victories recorded over the Western front, 9 were four-engine bombers.